The legendary Sergio Tacchini Orion track top now makes its return in classic Bex and Dom colourways to 80s Casual Classics. Just like for example the Fila Settanta Mk1, the Sergio Tacchini Orion track top has become a key part of our business and a signature casual style at 80s Casual Classics over the years. An original archive silhouette from the legendary Italian tennis brand, the Orion was made famous in the early 80s at the height of the American tennis legend, John McEnroe’s career, when he wore numerous Tacchini styles on the court and off it. The transition between traditional sportswear and casual wear was heightened with the likes of McEnroe constantly seen wearing the latest track top trends from the Italian designer sportswear label with young casuals itching to get their hands on each style. With a new casual appeal than your traditional tennis club members, Tacchini absolutely boomed in the 80s for its elitist appeal, original Italian designs and the sought after ‘Made In Italy’ label. Not to mention the fact it was worn by the one of greatest tennis legends that ever lived! 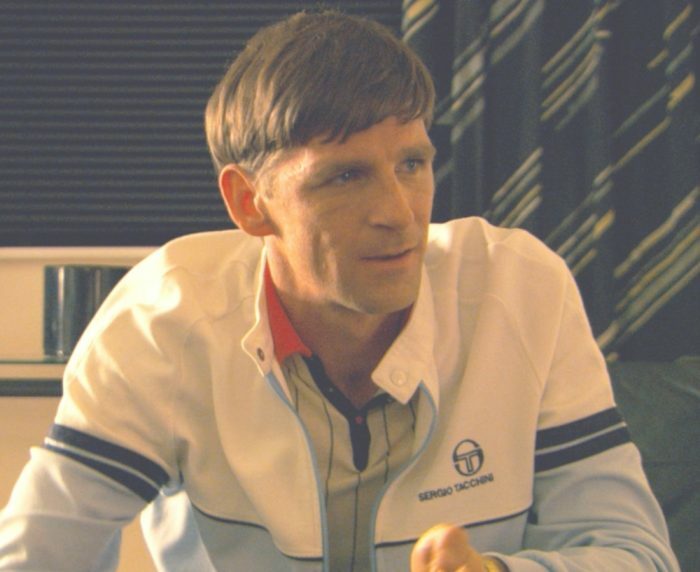 Above: Bex (Paul Anderson) wearing the Sergio Tacchini Orion track top in Nick Love’s The Firm from 2009. As worn by John McEnroe himself alongside many other notable Sergio styles such as the Ghibli, the Orion also featured as part of the Davis Cup USA uniform in an original navy colourway. 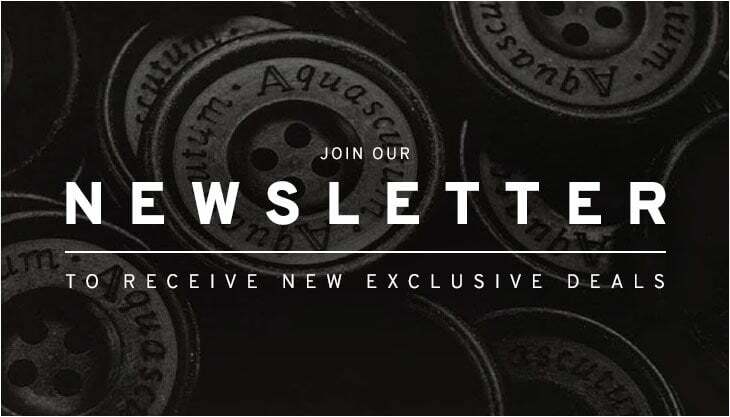 Its winning appeal quickly gained the attention of the casuals and has become one of the most recognisable styles from the nostalgic Italian sportswear 80s era. Those of you who have seen Nick Love’s The Firm from 2009 will also recognise the Orion from the film as famously worn throughout by Bex (Paul Anderson) and Dom (Calum McNab) in classic full tracksuit form. After working closely with Nick Love for the film it was decided the Orion should be a key piece for the film, not only that our very own Neil Primett actually sells Bex the Orion in the sports shop scene with the famous lines, “Put that yellow Sergio in the bag”. The Orion also featured in the film in the original sky blue colourway, although this version featured a biker style collar, similar to the likes of the Fila Terrinda Mk3 from the same era. Above: “Put the yellow Sergio in the bag”, Bex purchases the Orion to add to his flamboyant Italian sportswear collection. Now back at its spiritual home, the Sergio Tacchini Orion track top is back in all its OG 80s glory. The classic yellow and sky blue pastel colourways are now revived with original features throughout such as the signature 2 stripes to the sleeves, piping running across the chest and original Tacchini branding. An original and still the best, the Orion is a perfect addition for any casual collector or retro sportswear fans’ wardrobe. The saying “casual style never goes out of fashion” is certainly true but in the Orion’s case, it pretty much started it to begin with. 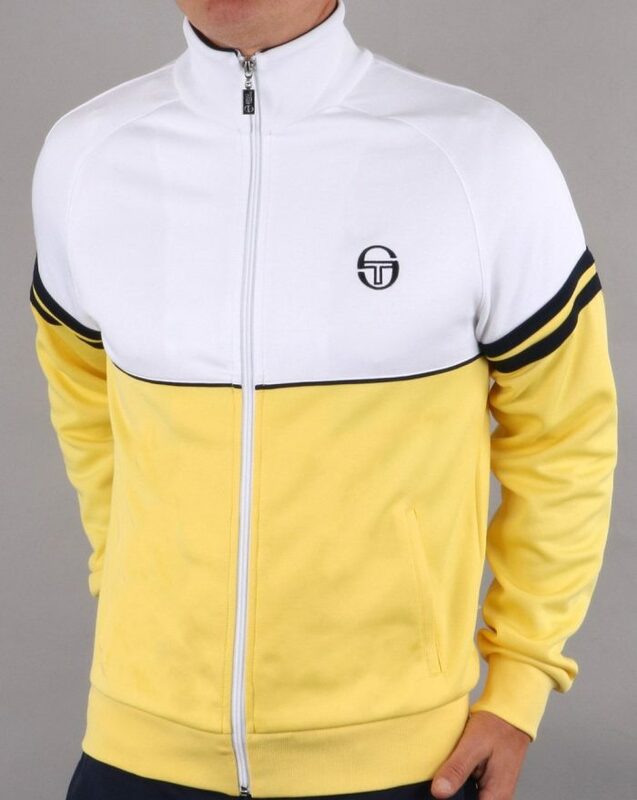 Above: The Sergio Tacchini Orion track top in yellow/white now available from 80s Casual Classics. 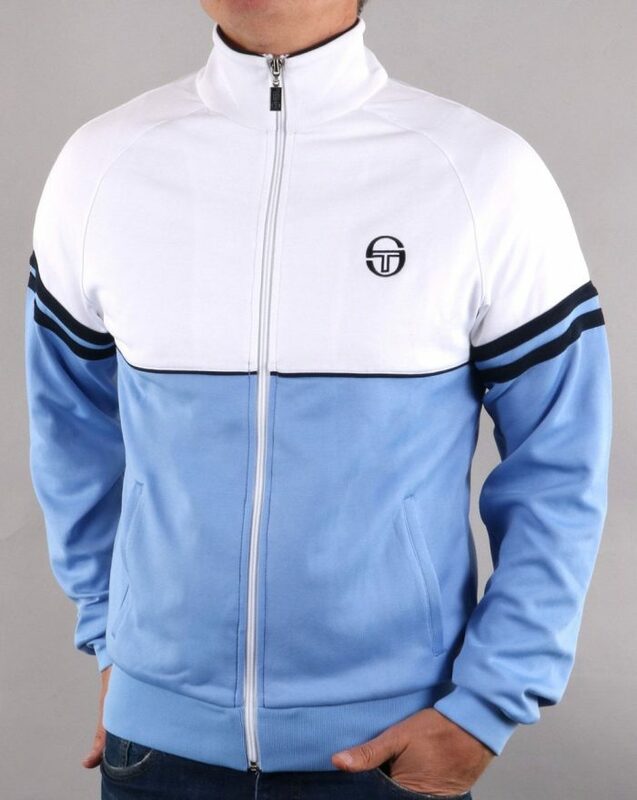 Above: The Sergio Tacchini Orion track top in sky blue/white now available from 80s Casual Classics.